Viral diseases are a special category of infections because the virus is not a living organism in the usual sense of the word. Viruses multiply only within cells and, in the view of the immune system , the virus-infected cells appear to be similar to cancer cells - as cells that are "crazed". For this reason, it is worthwhile to discuss the antiviral effects of adaptogens alone - against viral infections, they occupy completely different phytochemicals than those that are effective against bacteria . 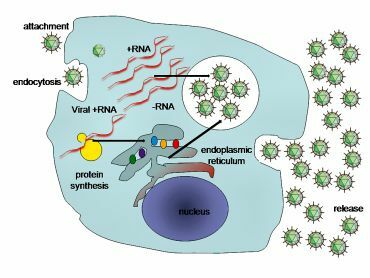 The viral particle consists of a nucleus in which the nucleic acid (genetic information of the virus) and the envelope (capsid) is made up of proteins and sometimes also of lipids. The virus capsule carries protein receptors that have the capability of specifically identifying the target cell, inserting viral genetic information into and utilizing all the source of the infected cell for the sole purpose of replicating as many other viral particles as possible. The infected cell usually breaks up after a while, and thousands of other viruses will be blamed for it. This process usually takes a few hours to several days for human cells. However, there are also viruses that behave differently - they integrate their genetic information into the cell's nucleus and behave quite well in the cell just to emit a few new viral particles around. For example, Eppstein-Barr virus (infectious mononucleosis) , or hepatitis (infectious jaundice) , the interest of which the host (so-called bacilonosic) survives and infected as many other individuals as possible. During evolution, silly viruses (eg ebola) turn into smart viruses (hepatitis, flu), superworthy (HPV, human papillomavirus, which sometimes causes warts and usually do not harm at all) and ultimately viruses completely integrated into the host genome. It is estimated that up to 15% of the genetic information of our cells is of viral origin. Slick viruses have the ability to change host behavior - for example, rabies virus causes aggression, and bites are transmitted to other victims. The smartest parasites, however, work with the host - for example the cat parasite Toxoplasma gondii(which is not a virus) helps cats to catch cats - changing their behavior so that cats are on their way. Therefore, even the presence of a totally lazy cat usually leads to the mass flight of rodents from the occupied territory. There is even a hypothesis that even otherwise reproducibly useless kissing in humans may be the result of modifying our behavior with a virus that originally transmitted through saliva and is now completely indecent. (Viruses transmitted by kissing actually exist, and when adolescents first grab them, they can cause a mild fever.) The most cunning viruses can also be a regular influenza that helps to save as much as possible with the exception of sneezing and coughing needed to spread the disease our health. When talking about the antiviral effects of antivirals , this is a much more diverse issue from the point of view of molecular biology than, for example, anti-cancer effects. This is because, while malignant cell scarring occurs in several pre-given processes, and cancer cells basically behave all the same, we have a much greater molecular diversity in viruses. Viruses are divided into a few basic types, depending on whether they have DNA or RNA in the nucleus, and whether their nucleic acid is single-stranded or double-stranded. The so-called the central dogma of molecular biology says that information in the cell is transmitted only one way, always in the direction of DNA → RNA → protein. Maintaining a central dogma is an important preventive rule that keeps both the cells themselves and all the species alive during evolution. But some types of viruses, such as HIV, have the ability to break the central dogma and the flow of information turn in the direction of RNA back to DNA. They use an enzyme called reverse transcriptase. 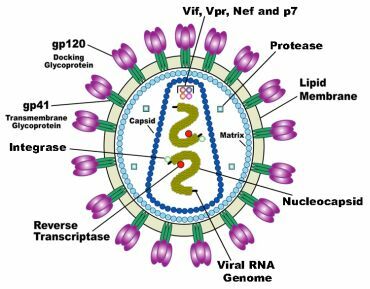 HIV carries in the nucleus of RNA,which first rewrites it into the DNA using its reverse transcriptase and then puts the cell in for transcription. This creates the nucleus of a large number of future HIV viruses, which, with the help of host ribosomes, naturalize the capsids and set off to infect other TH lymphocytes. Plants that have reverse transcriptase blockers are effective against HIV but are completely ineffective against DNA or RNA viruses that do not need reverse transcriptase because they replicate their nucleus using other types of DNA or RNA polymerases. Viruses are further divided into families by type of capsid, way of life, and relationship. Each family of viruses has its own specific features that some adaptogens occupy and others do not. However, there are some adaptogens that turn the attention of the immune system more in the direction of the antiviral response, and they help with most viruses (they can be inappropriate for bacterial infections). This category includes, for example, ginseng, which is suitable for cancer , flu and viruses, but should not be used in acute bacterial infections. Otherwise, in virology phytotherapy, we are dealing with a similar problem as with other infectious diseases : The rate of evolution of the pathogen during the infection is high, and the plants have no reason to participate in the human pathogens. Hence, human infectious diseases against phytotherapy have been fast and easy to obtain resistance for millions of years, hence the herbs have not prevented the epidemics of plague, syphilis or Spanish influenza in the past, so we welcomed penicillin in the middle of the 20th century as a triumph of phytotherapy science. Today, not even after 100 years, when MDR are already in the hospitals, the strains of infectious diseases resistant to most antibiotics available, the situation looks a little different again. We know that really effective antiviral adaptogens exist, but we also know that plants and fungi can not be wondered in this direction. In this article I list those that I have managed to find published studies without any guarantee of the systematicity and completeness of the information provided. Unfortunately, the detailed processing of phytotherapy options for all existing viral diseases is lacking and, in most cases, relevant studies are not available. The effect against Coxackie B3 virus was found in oroxylin A ( Kwon2016aao ), which is found, for example, in the Baikal Shishak and the Indian Tuberculosis . The true ginger is according to Dr. Duke is one of the most effective antiviral plants.